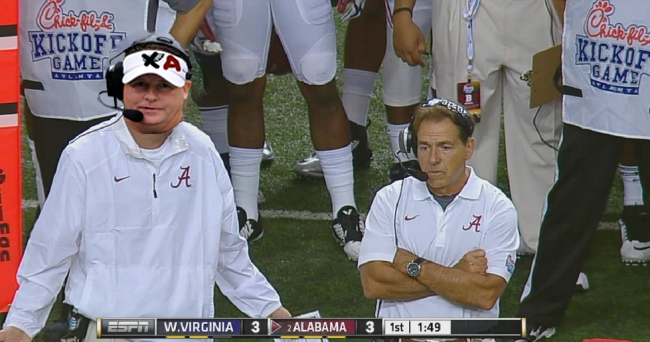 Dear, Alabama: Please hire Chip Kelly as your next offensive coordinator! When the Alabama Crimson Tide take on Florida State this September, Nick Saban will run out his third offensive coordinator in three games. After three successful seasons, Lane Kiffin was told to start at Florida Atlantic the week Bama played the national title game. Steve Sarkisian? Well, after pinch-hitting (and striking out) in the championship, Saban found out Sark was too much like Kiffin for his liking. Names I'm told could get consideration for #Alabama OC: Mark Helfrich, Chip Kelly & George Godsey who is tight with OL coach Brent Key. Sports can mean many things to different people, but at their core, they’re entertainment. And with that in mind, Saban and Alabama need to do the rest of the country a solid, back up the truck and hire Chip Kelly to run the Tide offense. "Well, Chip Kelly is a good friend of myself and a lot of coaches on our staff, and he just happened to be in the area and he stopped by and visited with us for a little bit," Saban said Saturday morning, "and not really anything of significance relative to this game." “As always, we will use it an opportunity to go out and hire the best coach available.” Who is better than the guy who was breaking scoreboards at Oregon? And who better understands that coaching in the NFL is an entirely different animal than Nick Saban? If Kelly were willing to take a year break and simply tour campuses and NFL facilities, he would almost assuredly have his pick of high-level college jobs at the end of next season. Considering that he’s still collecting paychecks from his last two NFL jobs, Kelly sure isn’t hurting for money either. But Chip is a football coach, and unlike the average person, the idea of a yearlong vacation might not appeal to him as much. You know what isn't on vacation? Football. Even though Chip would likely only be at Bama for a year, I would imagine that the opportunity to coach talent like Jalen Hurts and Bo Scarborough is pretty appealing. There are one million reasons why it won’t happen. There are probably double as many why it shouldn’t happen. It doesn’t matter, though.